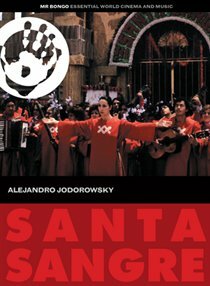 Alejandro Jodorowsky writes and directs this late 1980s horror following circus performer Felix (Adan Jodorowsky/Axel Jodorowsky) whose traumatic childhood has left him mentally disturbed. As a boy, Felix witnessed his father cutting off the arms of his mother, Concha (Blanca Guerra), and he has since spent years in an asylum. Upon his return to the now deranged Concha, Felix has to do her bidding. This involves murdering every woman with whom he comes into contact. When Concha orders Felix to kill Alma (Sabrina Dennison), his childhood sweetheart, he attempts to resist. Alejandro Jodorowsky writes and directs this late 1980s horror following circus performer Felix (Adan Jodorowsky/Axel Jodorowsky) whose traumatic childhood has left him mentally disturbed. As a boy, Felix witnessed his father cutting off the arms of his mother, Concha (Blanca Guerra), and he has since spent years in an asylum. Upon his return to the now deranged Concha, Felix has to do her bidding. This involves murdering every woman with whom he comes into contact. When Concha orders Felix to kill Alma (Sabrina Dennison), his childhood sweetheart, he attempts to resist.